We offer the prelicensing course both by classroom and online. This give you access to all the materials, including hard copy books, powere point presentations, text, and videos of each class. Our Live Classses are ongoing and can be started at anytime. We want you to be the best you can be. We also offer tutoring and counseling to help jump start your career. Our instructors are Colorado Licensed Real Estate Brokers with over 20 years experience. We are a Colorado owned and operated school since 1994. Call today for a better tomorrow. Sign up by calling 303-451-5100 or by clicking "Our Courses" and then select Brokers Prelicensing Course. Call us at 303.451.5100 for upcoming scheduled dates and locations. "Lots of valuable techniques, many of which I was unaware were going on, but am experiencing now on a daily basis." Licensed Colorado real estate professions, including real estate sales agents, broker associates, employing brokers and managing brokers, know A Plus Real Estate School. Founded by Tony Portararo in 1994, A Plus is a Colorado real estate school approved and regulated by the Colorado Department of Higher Education, Private Occupational School Board. A Plus specializes in prelicensing and Colorado real estate continuing education. A Plus offers a guarantee pass program and a guarantee placement program. A Plus also will provide tutoring and counseling. A Plus is a full service educator from the prelicensing course to starting your career and offering you all the continuing education requirements throughout your career. A Plus is the Center For Excellence in Real Estate Education. A Plus offers a premier selection of Colorado real estate continuing education courses developed by Tony and Debi Portararo. They are carefully designed materials so that you may take the courses by our classroom study, online or by distant learning. A Plus is approved and regulated by the Colorado Department of Higher Education, Private Occupational School Board to provide the Brokerage Administration and the Commission Update Courses along with many other continuing education courses by distant learning, online or by classroom. Learn to Negotiate Effectively Today! You can learn how to negotiate effectively in your professional and personal life. 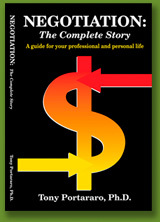 You can choose from among three options to learn the comprehensive lessons of Negotiation. They are available to you only from A+ Real Estate School, founded by Tony Portararo in 1994 and today a leading Colorado real estate continuing education school owned by Debi Portararo. Attention licensed real estate professionals. Tony developed continuing education, online and distance learning courses just for you, complete with support materials. In the Negotiation: The Complete Story course, you will learn how to effectively negotiate property transactions to satisfy your obligations to all principals involved. Our convenient online and distance learning packages let you learn on your own schedule and in your own location.